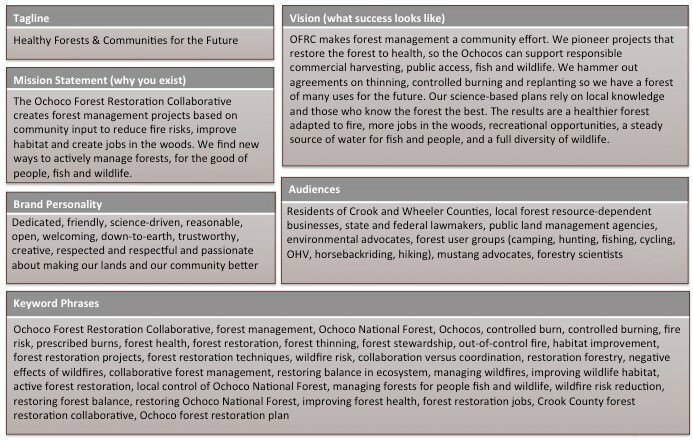 The Ochoco Forest Restoration Collaborative creates forest management projects based on community input to reduce fire risks, improve habitat and create jobs in the woods. They bring together local elected officials, environmentalists, private logging companies, scientists, tribes, agencies, ordinary citizens and policy experts to come up with new ways to actively manage the Ochoco National Forest, for the good of people, fish and wildlife. With the collaborative approach to forestry under fire from some critics, Moore Creative was hired to develop a message platform and web content so the organization could better communicate its work, goals and successes. The first step was guiding Collaborative leaders through a group branding session to discover internal insights about the brand: Why should anyone care about their work? What sets the organization apart? What messages have worked or bombed in the past? What personality should the Collaborative brand convey? Next, a communications audit was conducted to gather insights from media reports, the websites of peer organizations and the Facebook feeds of stakeholders. Recurrent themes and the language local people use to talk about forestry were captured, along with areas of confusion and inaccurate statements about the Collaborative. Third, keyword research was conducted to discover common search phrases and the best keywords to incorporate in messaging and future content. A one-page draft message platform including Mission Statement, Vision Statement, Brand Personality, Audiences and Keyword Phrases. To test the effectiveness of the draft messaging, phone interviews with key stakeholders were conducted to get reactions. Insights from these influencers resulted in wordsmithing to gain better resonance across all groups. The selected tagline: Healthy Forests & Communities for the Future. Working under a tight deadline to meet grant requirements, Merry Ann drafted web content based on the foundational messaging work. An outreach campaign is slated next. Merry Ann Moore created brand messaging and web content for a forestry group, to help them better communicate their work, goals and successes. The project included a communications audit of supporters and critics, keyword research and tagline development.